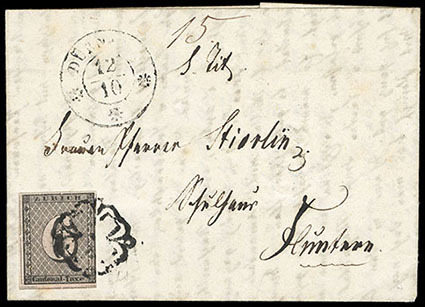 Switzerland, Zürich, 1846, 6rp black, horizontal underprint, three large margins to just shaving at right, tied by black rosette cancel with matching Dürnten 12.10 (1846) double circle on folded cover with red Zurich backstamp, F.-V.F. Zumstein No. 2W SFr 5,400 ($5,440). 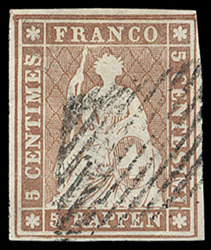 Switzerland, Geneva, 1851, "Neuchâtel", 5c black & red, four large margins, defective, Very Fine appearance; with 1985 Rellstab certificate. Zumstein No. 11 SFr 5,400 ($5,440). Scott No. 2L7 Estimate $200 - 300. 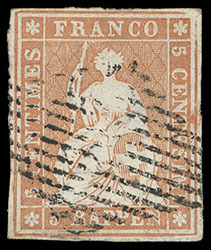 Switzerland, 1854, Sitting Helvetia ("Strubel"), 5rp orange brown, emerald silk threads, first Munich printing, bright color, fine impression, four full white margins, light grid cancel, Very Fine; with 1985 von der Weid certificate. Zumstein No. 22Aa SFr 2,250 ($2,270). Scott No. 14 Estimate $400 - 600. 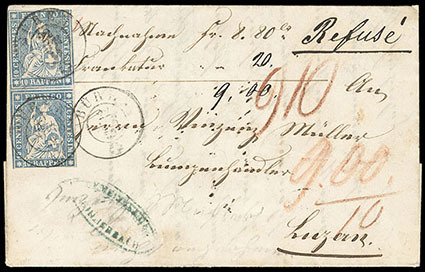 Switzerland, 1854, Sitting Helvetia ("Strubel"), 5rp red brown, emerald silk threads, second Munich printing, lovely fresh color, four large white margins, neat grid cancel, Very Fine. Zumstein No. 22A SFr 200 ($200). Scott No. 15 Estimate $75 - 100. 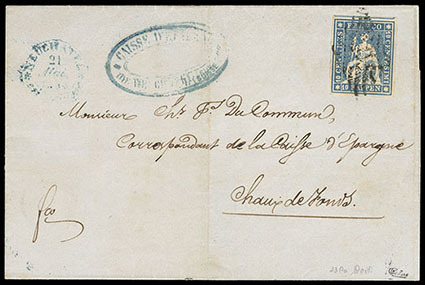 Switzerland, 1854, Sitting Helvetia ("Strubel"), 10rp blue, emerald silk threads, first Munich printing, four large margins including part of next stamp at top, tied by 11 bar grid on folded cover to Chaux de Fonds with blue Neuchatel 21.Mai.56 cds of origin, Extremely Fine; signed Calves, with 1987 von der Weid certificate. Zumstein No. 23Aa SFr 2,500 ($2,520). Scott No. 16 var. Estimate $500 - 750. 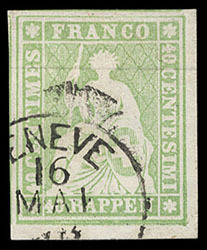 Switzerland, 1854, Sitting Helvetia ("Strubel"), 10rp blue, emerald silk threads, second Munich printing, horizontal pair, four full white margins, two grid cancels, Very Fine. Scott No. 16. SBK SFr 250 ($250). SBK No. 23A Estimate $100 - 150. 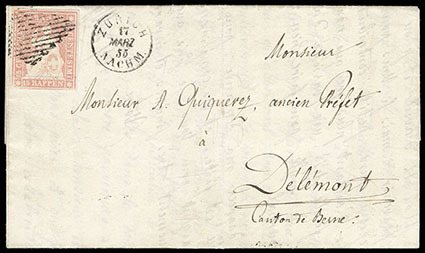 Switzerland, 1854, Sitting Helvetia ("Strubel"), 15rp pale rose, emerald silk threads, first Munich printing, three large margins to just touching at bottom, bright fresh color, tied by grid cancel with matching Zurich 17.Marz.55 thimble postmark on folded cover to Delemont, Very Fine and choice; with 1991 von der Weid certificate. Zumstein No. 24Aa SFr 1,600 ($1,610). Scott No. 17a Estimate $300 - 400. 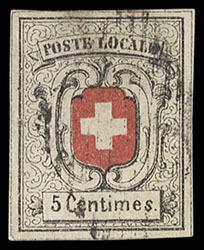 Switzerland, 1855, Sitting Helvetia ("Strubel"), 10rp blue, carmine silk threads, two singles tied by Buren 22. Apr. 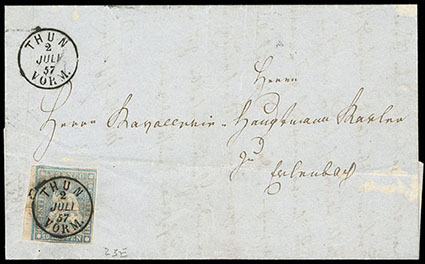 59 postmark on folded cover from Schlierbach to Luzern, this is a collection letter which was refused, Fine. Zumstein No. 23C. Scott No. 27 Estimate $75 - 100. 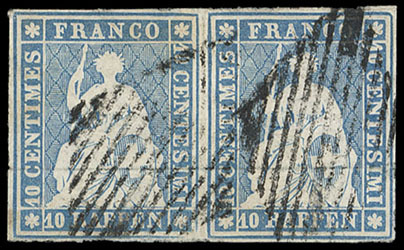 Switzerland, 1857, Sitting Helvetia ("Strubel"), 10rp blue, carmine silk threads on thin paper, cut in on two sides and with sheet margin at left, cancelled by perfect strike of Thun 2. Juli. 57 thimble postmark on folded cover to Erlenbach, second strike of cds above, Fine and attractive. Zumstein No. 23E SFr 1,100 ($1,110). Scott No. 27a Estimate $200 - 300. Switzerland, 1855, Sitting Helvetia ("Strubel"), 40rp yellow green, maroon silk threads, outstanding four margin single with huge margins, bright fresh color, neat Geneve cds, Extremely Fine and choice. Scott No. 29. SBK SFr 140 ($140). SBK No. 26C Estimate $100 - 150.